Posted on February 28, 2017 by Barry V.
I spent the early morning hours of my second day on Nantucket at Hummock Pond, which abuts Mass Audubon’s Lost Farm Wildlife Sanctuary. As any New England birder will tell you, November is “duck time”, and Hummock Pond is an excellent place to take in the show. The light is good this morning, and an excellent variety of waterfowl are present, including canvasbacks, wigeon, scaup, bufflehead, gadwall, Canada geese and mute swans. 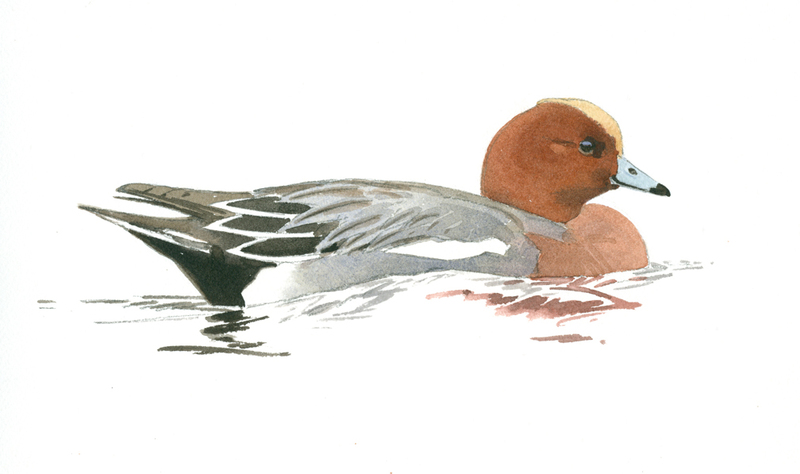 With a little searching, I also locate a single redhead and a single Eurasian wigeon! Canvasbacks are the NFL linebackers of the duck world, with necks like Gronkowski! They exude strength and power. A flock of two dozen “cans” are present when I first arrive, but most of them take flight within a half hour, and I’m left to study the four or five stragglers that remain. 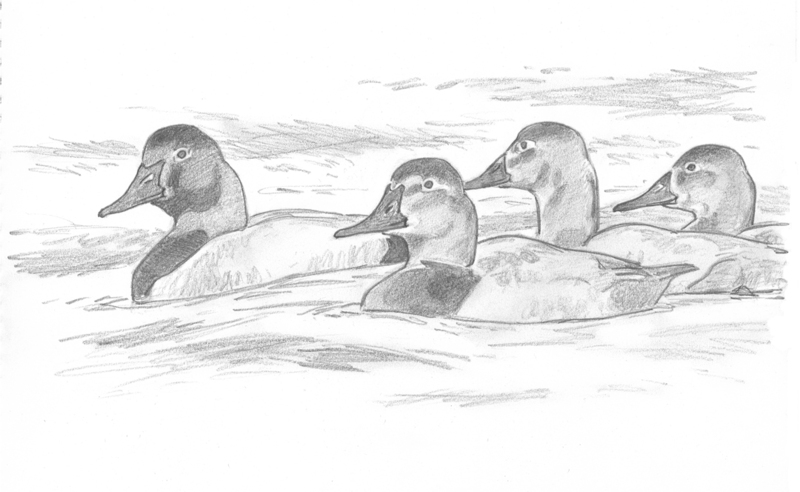 Most of the ducks at Hummock Pond are quite far off – easy to I.D. with the scope but too distant for sketching. 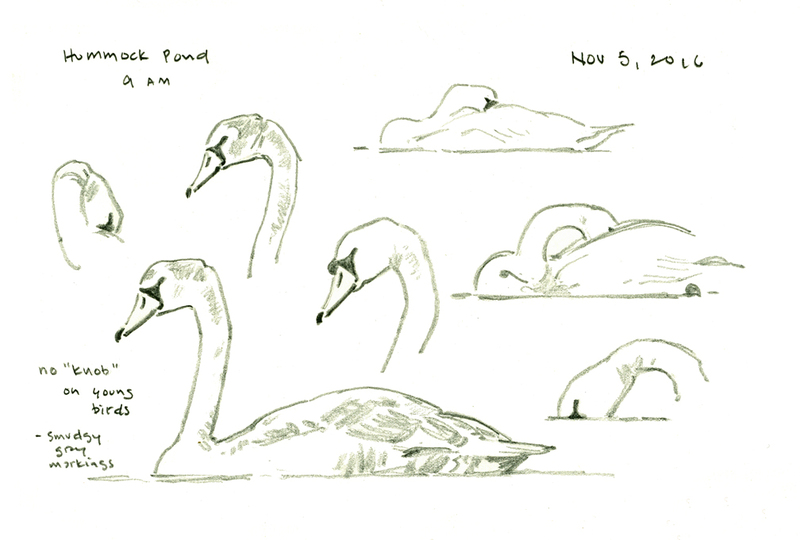 I try to approach a group of wigeon more closely, but they spook and take off, so I content myself with sketching some nearby mute swans and buffleheads, filling a page in my sketchbook. As I prepare to leave, some movement catches my eye abit further down the shore. 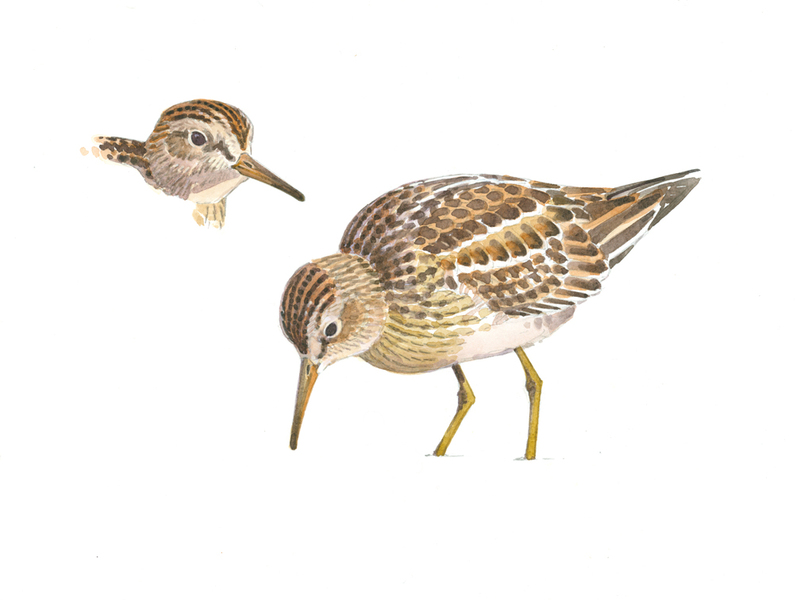 It’s a smartly patterned juvenile pectoral sandpiper. It affords me stunning, up-close views with the scope, and the morning light is perfect to bring out every detail. The bird is actively feeding, and in constant motion, but I make some pencil studies to explore its characteristic shapes and gestures, then take some digital photos. Back in the studio, I determine to make a more comprehensive study. The challenge with a bird like this is to avoid over-rendering the details – and in the process, destroying any sense of life. I struggle to maintain a light touch, despite the fact that to do the bird justice, I need to render almost every individual feather. 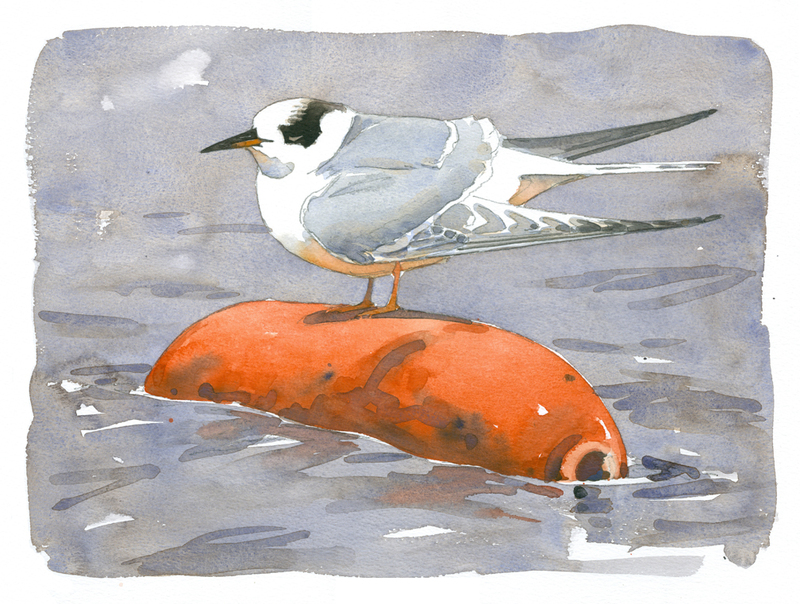 At Sesachacha Pond, (it’s pronounced SACK-a-ja!, like a sneeze, according to Edie) I find a single Forster’s Tern perched on a small lobster bouy or net float. It scissors its wings and tail to maintain balance, and hunkers down in the breeze. I especially enjoy the way the color of the bouy reflects onto the birds’s undersides, giving it a glowing belly! Although there should still be a few common terns around at this late date, the only tern I saw during my visit to Nantucket was this one. This entry was posted in Artists, Barry Van Dusen Residency, News and tagged Barry Van Dusen, buffleheads, Canvasbacks, Forster’s Tern, Gronkowski, hummuck pond, juvenile pectoral sandpiper, Lost Farm Wildlife Sanctuary, Mass Audubon, mute swam, Nantucket, scrub oak, Sesachacha Heathlands Wildlife Sanctuary, Sesachacha Pond, Sketchbook, wigeons on February 28, 2017 by Barry V..
Posted on February 10, 2017 by Barry V.
Although the official list of Mass Audubon Sanctuaries names only Sesachacha Heathlands, the Society actually owns three properties on Nantucket. Sesachacha Heathlands is the largest and most ecologically significant, but the other two properties are equally interesting. My overnight accommodations are at Lost Farm Wildlife Sanctuary – a 90 acre tract that borders Hummock Pond and features an extensive pitch pine forest. 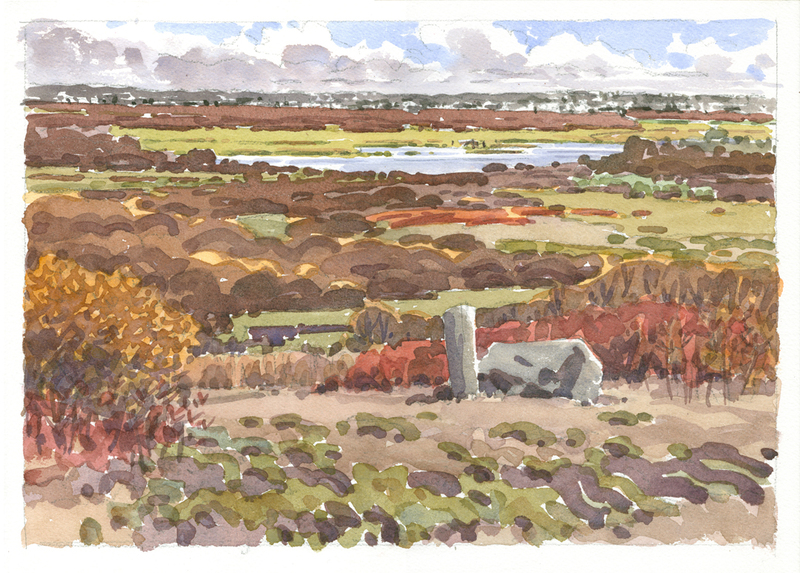 Mass Audubon’s smallest property on Nantucket is a 30 acre parcel at Smith’s Point near Madaket. On my first day, Ernie Steinauer, Mass Audubon’s director of sanctuaries on Nantucket, gives me a tour of the Smith’s Point property, and then shows me some extensive areas of sandplain grassland at Medaket and Miacomet Plains. 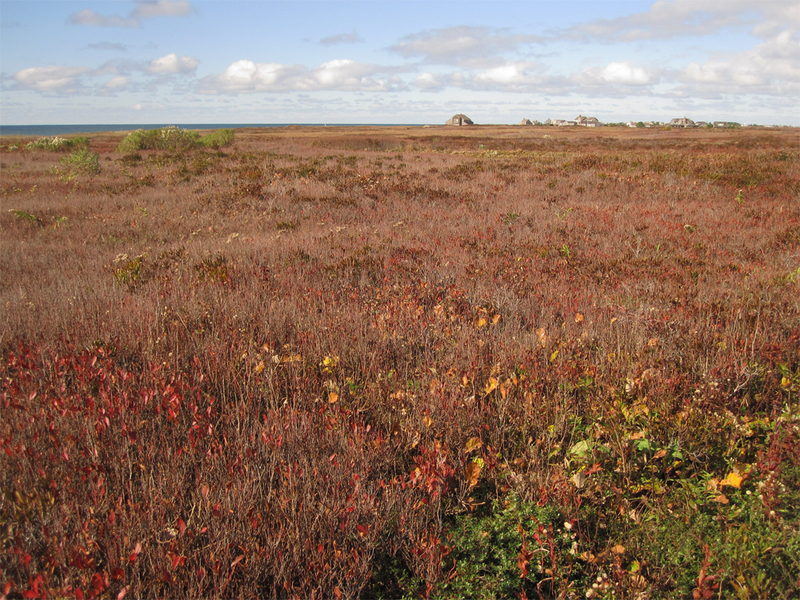 Like coastal heath, New England sandplain grassland is an extremely rare and localized natural community, and the best remaining examples in the world are on Nantucket. I soon realized that the landmass of Nantucket exists very much at the whim of wind and waves. 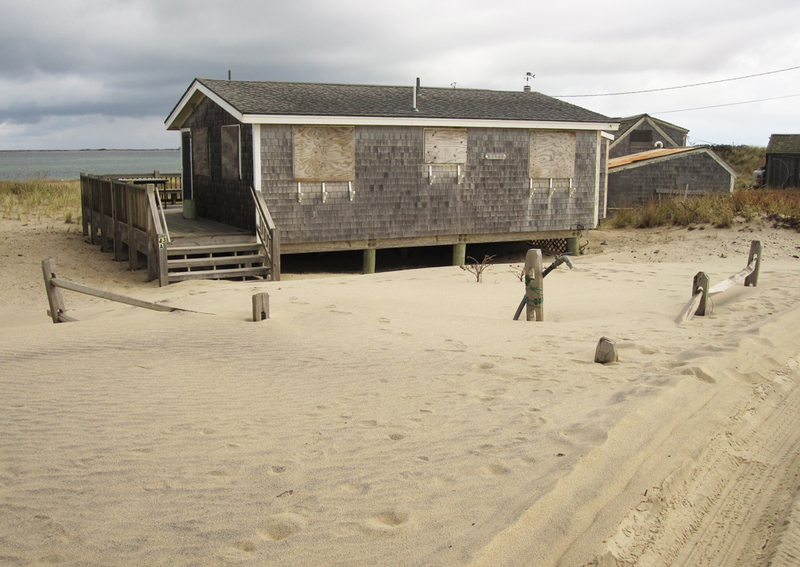 The section of Madaket Beach at the base of Smith’s Point is rapidly being buried in sand, as a big dune marches over the area. 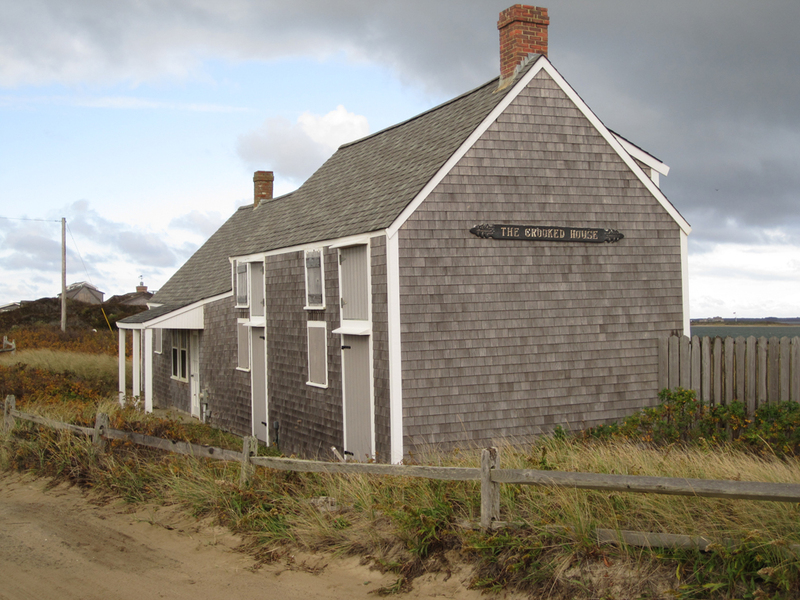 In the front yard of this cottage (just a few doors away from Mr. Roger’s Crooked House), a split rail fence is nearly buried, with only the tops of the fence posts still visible above the sand. 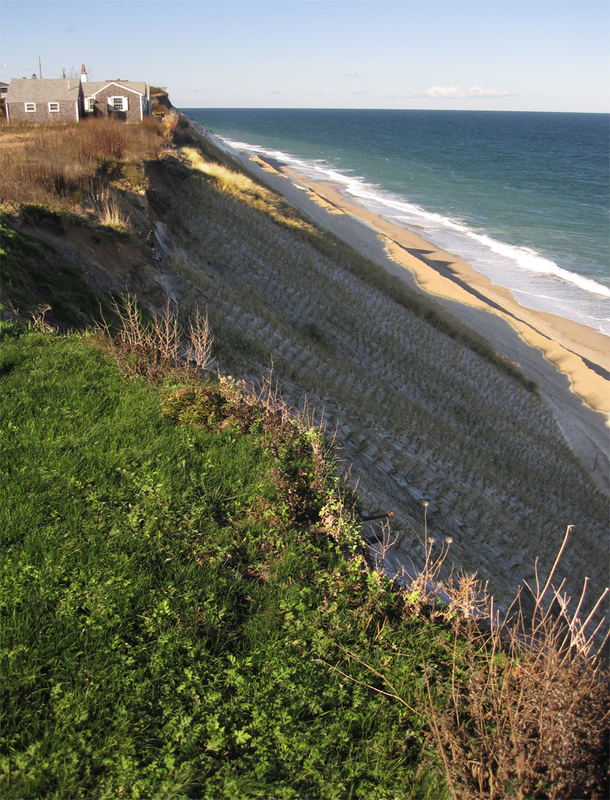 Elsewhere on the island, property owners are plagued with the opposite problem: EROSION. Later in my stay, I visited Siasconset on the south shore, where homes along the top of a 100 ft. bluff are watching their backyards crumbling into the sea at an alarming rate – some losing as much as 30 feet of property in a single winter storm. Contractors are busy moving several homes back from the edge of the bluff, and a neighborhood association is scrambling to find ways of slowing the erosion. Ernie had made arrangements with two eminent Nantucket birders to continue my orientation tour, and I meet up with Edie Ray and Ginger Andrews at mid-day. Their expert guidance familiarizes me with the best routes and vantage points, and furnishes a deeper understanding of both Nantucket’s natural history, and the challenges involved in protecting the remaining natural areas. 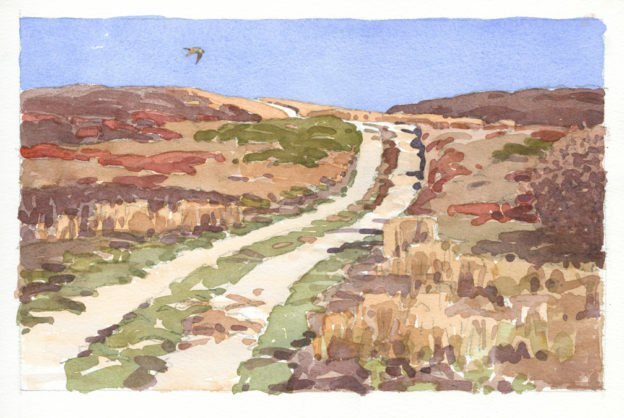 Although early inhabitants viewed the expansive coastal heaths in the center of the island as a desolate wasteland, today this area is recognized as a “globally rare community”, with the Nantucket Heath representing the best remaining example in the world. Mass Audubon’s Sesachacha Heathlands sanctuary preserves more than 800 acres of this unique habitat. The reserve can be accessed by navigating a maze of crude sand tracks, and Edie and Ginger show me how to find the two highest points in the moors. From the summits of these hills, I can take in the expanse of the heath, rolling away in all directions. 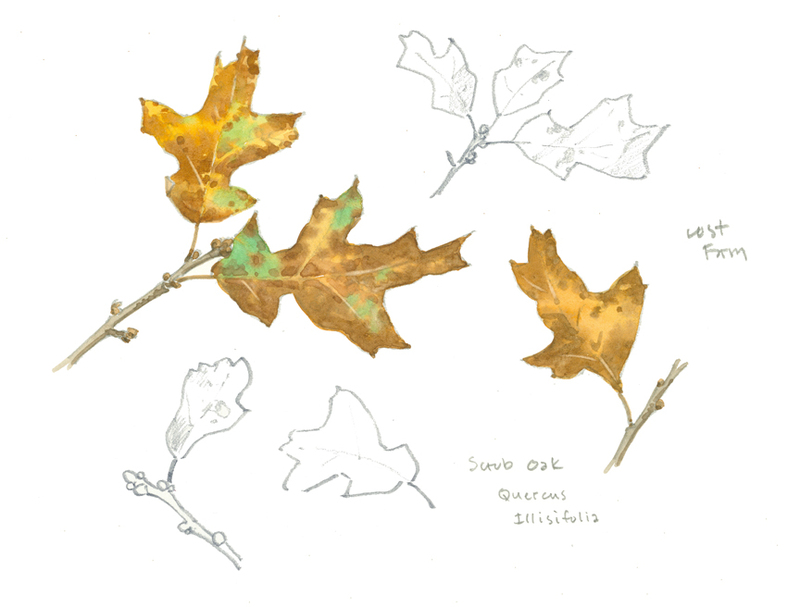 I have, by necessity, stylized the heath vegetation in my watercolor, but anyone familiar with the botany of the heath should be able to pick out the dominant plants. 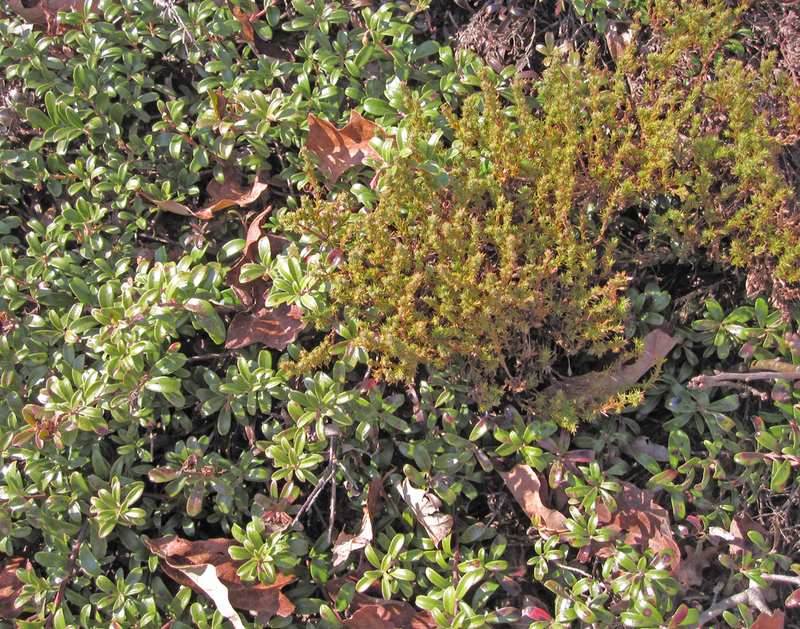 In the near foreground is a mix of bearberry and false heather: low-growing shrubs that form a dense groundcover. The bright red patches are huckleberry, and the masses of purplish brown are scrub oak. You might also pick out a patch of little bluestem grass in the middle ground, and a distant patch of high tide bush – showing mint-green in the distant right. Another big swath of scrub oak spans the ground beyond the bog, and in the distance are the developed areas of the south shore. I painted a related watercolor back in my studio. I wanted to create another composition that emphasized the gently rounded shapes of the moors, and by introducing one of the sand tracks, I could lead the eye into the scene and help define the rolling topography. I had seen a merlin an hour earlier at nearby Sesachacha Pond, and introducing it into my scene for a sense of movement. 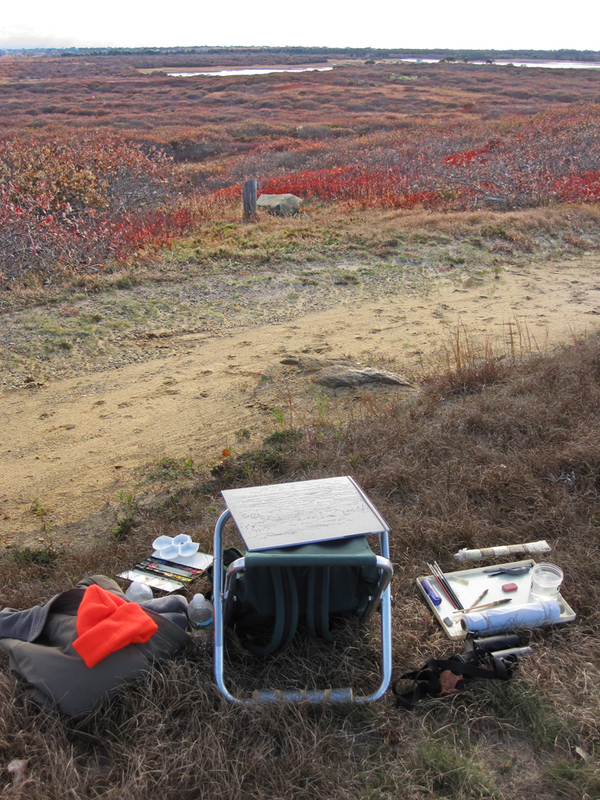 This entry was posted in Artists, Barry Van Dusen Residency, News and tagged bearberry, Coastal heath, Edie Ray, Erosion, false heather, Ginger Andrews, globally rare community, huckleberry, little bluestem grass, Lost Farm Wildlife Sanctuary, Medaket Plains, merlin, Miacomet Plains, Nantucket, Nantucket Heath, sandplain grassland, Sasachacha Heathlands Wildlife Sanctuary, scrub oak, Siasconset on February 10, 2017 by Barry V..